Perfect for individuals, artists, and small businesses, these DIY photo products make it easy for you to make professional photo displays and photo books, without the requirement of any equipment or special training. Our GOframe canvas stretcher kits have everything you need to wrap your own printed canvas. The framless finished look is clean, and very popular! Plus, they stick out from the wall about 1 ½", adding texture and interest. To get started, all you need is a canvas kit in the size of your choosing and the starter kit. The canvas kits come in several sizes from 11" x 14" up to 20" x 30" while the starter kit includes the corners and glue you need to make it, as well as a trimmer for a perfect finish. These DIY canvas wraps are a great option for photographers and artists that want a way to sell their artwork, but don't want to have invest in the high quantities or high cost of outsourcing to a professional print shop. 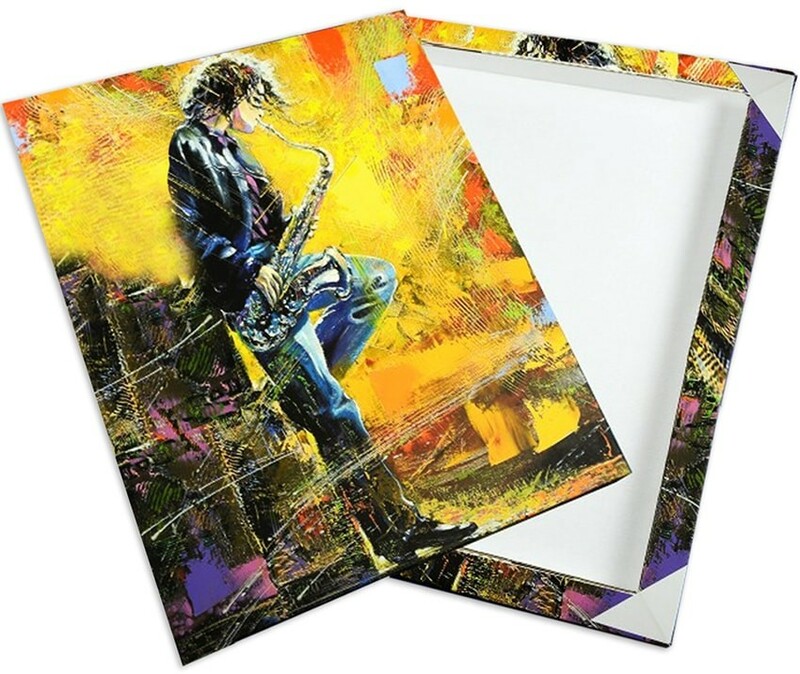 Just have your artwork printed on a canvas material of your choice, and use our wrapping kits to make a premium display that won't hurt your budget. Pinchbooks are an awesome new invention-- they're one of my favorite products! They let you quickly make photo books that look incredibly expensive...and when I say quickly, I mean in 5 seconds flat. They have a unique spine that opens to allow for photos when you just pull open the covers enough, and then when you close the covers again, they create an incredibly strong bind. Similar to a clip-in cover, but in a hard cover format and SO much better! These photo blocks are super cool...they are self-stick, which means you just peel off a liner and stick your photo or print on. They are perfect for last minute DIY photo gifts, to offer a more modern way to sell your photos over a traditional canvas or frame. They stick our from the wall about 3/4", and actually come with this cool screw-in easel bar that lets you display them on a tabletop as well. Or if you want to hand it, the bar is hidden on the back so you can keep everything together. These photo wraps are kind of like the canvas wraps, but a more affordable option to get a similar look. They are called JetMaster photo wraps, and they have a 1 ½" thick frame with easy peel-and-stick application. They can be made on the go, in schools for projects, at home for art displays, and at the office or retail store for promotional displays. These photo displays let you create beautiful prints quickly and as-needed. These dimensional frames can be made in just a few minutes and are so easy, anyone can do it. All you need to make custom canvas prints are the photo wraps in your chosen size and a handheld cutter.